pretty neat. I want to see the move! a half was a big no-no for me. That’s not how it was in the games. I would say, jokingly, ‘We have to respect the pixel.'" Apparently, the Rules of 8-bit Game Design allow for 16-bit colored sprites. Rockman, this is a movie first and foremost. They probably had to make him more colorful so it would grab people's attention. As much as I love 8-bit sprites, I can understand why only three colors wouldn't work well for a movie. That said, at least they had the guts to deal with other, non-sprite artists trying to force fractions of pixels to be uneven. That would've been a mess anyone would've caught. Rockman said: "Apparently, the Rules of 8-bit Game Design allow for 16-bit colored sprites." Eh, look at the sprites from Punch-Out!! (arcade version) some time. They're quite colorful. 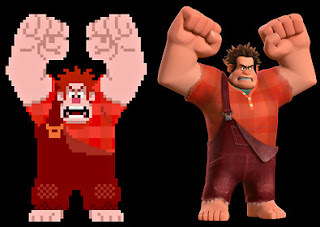 The ones in Nintendo's Popeye are also pretty colorful, too. @Rockman: Because the NES was the only 8-bit system in existence, right? Though, on that note, it's actually a bit of a common misconception that the number of "bits" a system's processor has would be directly responsible for the way graphics look or music sounds, but that's neither here nor there, I suppose. My point is, there's lots of different systems that were 8-bit, and not all of them had the exact same color palettes. And since this is supposed to be an arcade game, it's still well within reason for it to have as many colors as it does, as MANY arcade machines had much larger color palettes than what the NES had, and yet they were still 8-bit machines. What Clown Prince said, and basically everyone else on the matter of the colors. But anyhow, I'm pretty glad that they looked at actual 8-bit games for inspiration and study to design the character's 8-bit likeness. It's much more authentic that way and more realistic, something that fills me with hope for this movie even if it doesn't have everything I want (like Wily). That said, whether this movie does have MM references or not, I'm still going to go see it.